Beautifully engraved certificate from the City Railway Company issued in 1893. 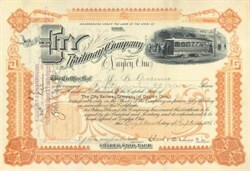 This historic document was printed by the New York Banknote Company and has an ornate border around it with a vignette of an electric railway car. This item is hand signed by the Company’s officers and is over 115 years old. 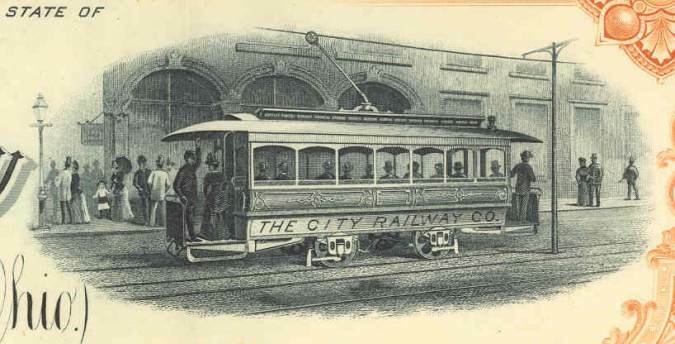 Initial electric service began in August of 1888, only a year after the first successful electric street railway was installed in Richmond, Virginia. The first line in Dayton proved profitable and a second line followed in 1890. By 1895, all horses has been sent to pasture and Dayton's public transit was completely electrified. Dayton at one time had five street railway companies, but mergers over the years have resulted in one company. The present City Transit Company was formed in 1955 through a merger of the City Railway Company (incorporated in 1893) and the Dayton & Xenia Railway. City Transit took over the Oakwood Street Railway and Dayton Suburban Lines in 1956, consolidating all major transit companies into a single operation.